Legendary action filmmaker Robert Rodriguez has just shot a new movie in secret. And it stars John Malkovich. But here's the rub. We won't get to see the movie for another 100 Years, which, fittingly enough, is the title of this cinematic oddity. It may go down as one of the most ambitious stunts in movie history. It might even irritate fans of both the actor and director. Because you'd have to be born today, and live to 100, to be able to see it. The rest of us? We'll all be dead long before the premiere. Robert Rodriguez's 100 Years is being locked away in a time capsule vault. And the time lock insures that the film will not be released for viewing for one century. We won't even know what the movie is about until that time, with all story details being kept under wraps. The cast has been announced, though. 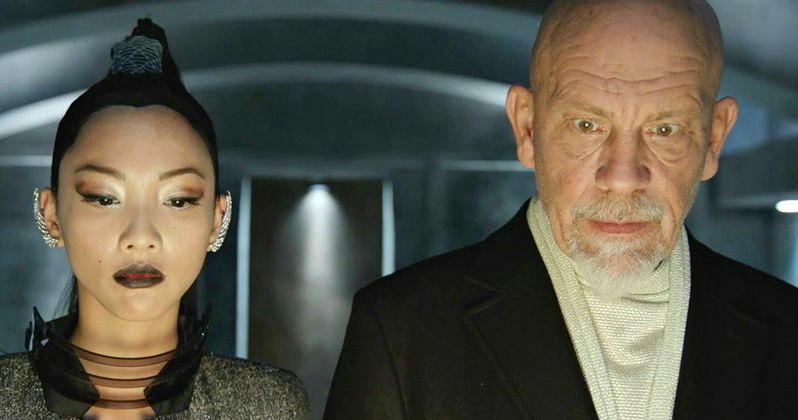 Joining John Malkovich on this journey are Marko Zaror, who was seen in Robert Rodriguez's Machete Kills, and Shya Chang, who is relatively new to the industry. The movie was written, directed and conceived as a unique cross promotion for the luxury liquor Louis XIII Cognac. The bottles currently on store shelves are from 1915, exactly 100 years ago. And the new bottles being manufactured today won't be sold until 100 Years from now, just like this mystery movie. We assure you, this is no joke. The company decided that they wanted to commission a piece of art and dedicate it to their craft. Thus, Robert Rodriguez and John Malkovich were called in. And the idea for 100 Years the movie was born. Global executive director of Louis XIII, Ludovic du Plessis had this to say in his announcement. "Louis XIII is a true testament to the mastery of time and we sought to create a proactive piece of art that explores the dynamic relationship of the past, present and future." About the film, Robert Rodriguez will only say that it is 'emotionally charged'. He has released three different teasers, which do not show any footage from the movie. Instead, they present a different version of what the future may look like when 100 Years is released on November 18, 2115. About the project, John Malkovich had this to say. "There were several options when the project was first presented of what [the future] would be. An incredibly high tech, beyond computerized version of the world, a post-Chernoybl, back to nature, semi-collapsed civilization and then there was a retro future which was how the future was imagined in science fiction of the 1940s or 50s." This is what Robert Rodriguez had to say to Indiewire had to say about the movie. "It's the first time I've ever done anything like this, I was intrigued by the whole concept of working on a film that would be locked away for a hundred years. They even gave me silver tickets for my descendants to be at the premiere in Cognac in 2115. How cool is that? What John and I wanted it to be was a work of timeless art that can be enjoyed in 100 years. I'm very proud of it even if only my great grandkids and hopefully my clone will be around to watch." As we said, don't expect to see any footage from the movie, which we assure you does exist, in these three teasers. There won't be any footage or teasers released until sometime in the year 2114, in anticipation of the movie being removed from the vault. How will people react to this in 2115? Will it be a big deal? Or will we even be around in 100 Years. Or is this just plain irritating, because we'll never know what it is? Take a look.